It used to be that if you wanted to know what people wore 700 years ago you had to find the names of rare, large books and order them from interlibrary loan, or visit period funeral monuments and see what they were wearing. It was all a lot of work. Nowadays, it is as easy as typing a few words into a search engine online. And once you start down that rabbit hole, you can, with a little thought, find yourself looking at digital scans of real books from the last thousand years and more, primary resources for what people wore. Hence the title – with such resources available today, there is no real excuse for anyone interested in wearing decent looking clothes to get it wrong. Of course some may not have time, brainpower or whatever to carry out the research. Even so, there are now lots of books on the topic, blog posts and suchlike, showing pictures and discussing accurate costume. for 13th century is red, madder sort of colour. Knee length, a bit tighter than many others, open at the front. THe cloth has a more open weave than I would like and is mildly fulled, which is probably accurate enough. 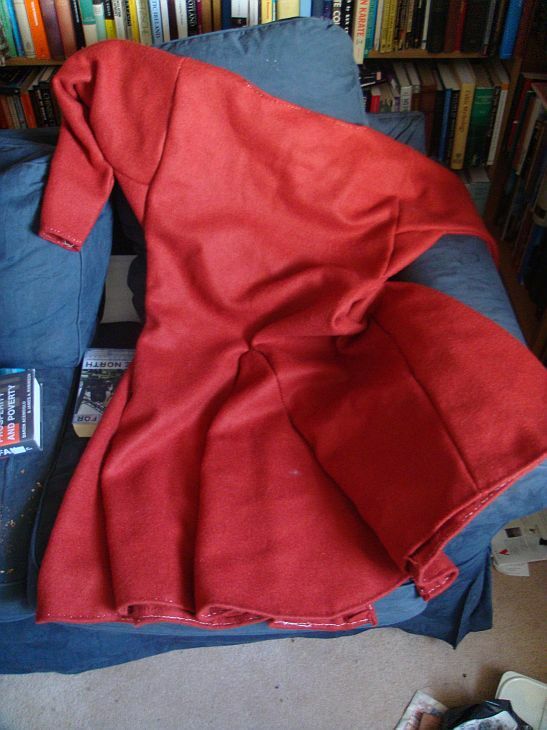 It replaces a tunic whose diamond twill undyed fleece colour is probably more accurate for the 10th or 11th century but I didn’t know that when I made it. I suppose the only circa 13th century event we’ll end up with this year is Lanark, but it does get a little dull wearing the same clothing year after year, although we don’t wear it enough to wear them out. A song of Spice and Fire; adventures in medieval cooking.